When I think of my mom, this one really brings me back in time. Dad had his amazing garden and that was when this beef stew was the absolute best stew ever. Everything was made fresh. I love stew when it's cold out but you have to have that end of summer pot of stew with fresh vegetables. It just has a way of making me really hate to see summer end. In winter it keeps us warm and satisfied when eating a hot meal reminiscing of summer. Sometimes nothing else works better than a good homemade pot of beef stew other than soup on those blustery cold days, so enjoy this all winter long. This is an easy throw together stew that does the trick! Mom made this once a week in the winter months, long long ago, this recipe is over 100 years old! Lucky for us in Upstate Utica, New York, the garden dad had was fantastic and plentiful. He grew potatoes, tomatoes, beans, peppers, the list goes on. I never forget the tender chunks of meat and wonderful sauce to sop up the bread! In a large saucepan add 3 tablespoons olive oil saute meat 4 minutes on each side. Add tomato paste, garlic saute 2 minutes (and onion if using). 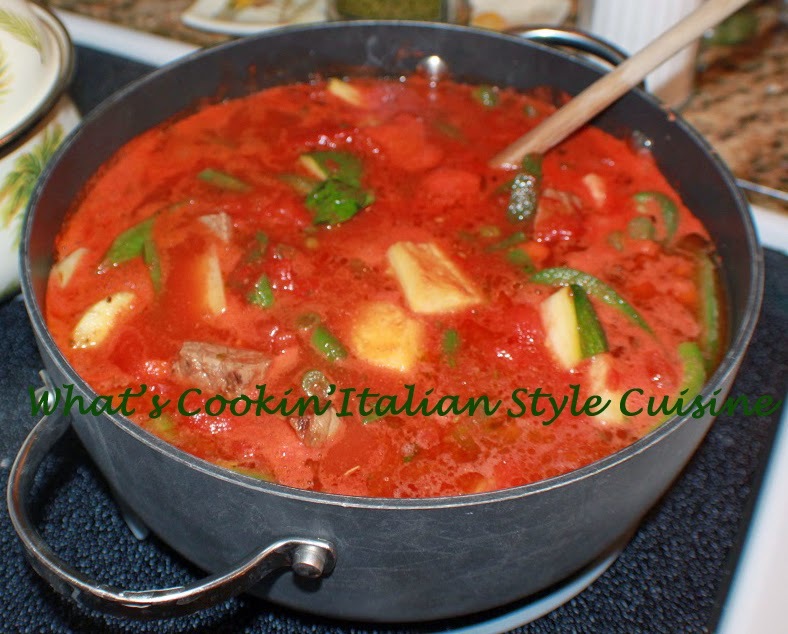 Add pepper and all the rest of the tomatoes, zucchini, peas, potatoes, green beans and any other vegetables of choice, then add these herbs, along with 1 teaspoon dried oregano, 1 teaspoon granulated garlic, salt and pepper to taste. I also add a dash of cayenne pepper or red pepper flakes for heat. Stir in the wine and blend together. Cook for around an 2 hours on low Serve with crusty Ciabatta bread. This looks amazing. I'll take a big bowl please. It felt SO cold when we went out this this evening. Wish I came home to your wonderful, warm and hearty stew! !